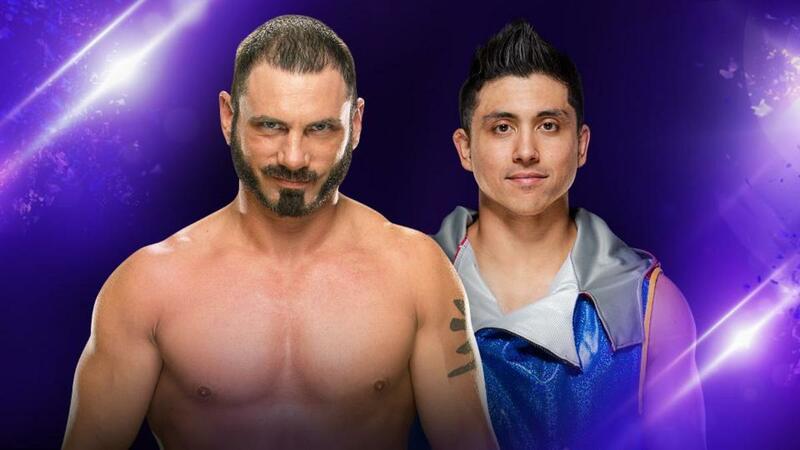 After beating TJ Perkins in the main event, Austin Aries was jumped by both him and Neville after the match, making it clear that he’s at a disadvantage at Payback with TJP in Neville’s corner. Alicia Fox broke up with Noam Dar to hook up with Rich Swann, but Swann revealed his true intentions, leaving her in the dust. Tozawa and Kendrick continued their very long lesson session. Akira Tozawa came out for his match. As he did, they showed footage of what went down last week in the Tozawa/Brian Kendrick feud. This was mostly just a match to further the angle -- it wasn't bad, but nothing you’d remember. Nese controlled a lot of the match. Halfway through, Kendrick came down to meddle. He started to hop on the apron, which got Nese’s attention and allowed Tozawa to roll him up for the win. Nese was none too happy about this, and laid Kendrick out after sharing some words with him. Tozawa grabbed a mic on the outside and said this is lesson number three: you need to have eyes in the back of your head. Rich Swann came out to talk about Alicia Fox, but was quickly cut off by Noam Dar, who wasn't happy. He yelled at Swann about interfering in Dar and Fox’s relationship and called him a rat. Fox then came out. Swann asked who will it be, Foxxy? Dar, stunned, wanted to know what this was all about. Fox first addressed Dar, dressing him down by saying his cologne stinks, he’s immature, and he can't cook. She revealed that she never really cared about him, and was just using him as he seemed to have potential. She was also annoyed by the way he says "Alicia Foooooooooooooox." She officially dumped him. The crowd halfheartedly at best sang the goodbye song as he left. Fox then focused her attention on Swann, thanking him for all the gifts. Swann said they all came from the heart. She said she’s going to give him what he deserves, leaning in for a kiss, but he stopped her. Swann asked if she remembered Cedric Alexander. He said she left Alexander high and dry; he’s one of his closest friends and for that you get what you deserve. He shunned her and made his exit. Alicia said fine, being single is fine anyway. She went after the crowd over the “what” chants and started talking about Louisville being her city as she was eventually cut off. Ariya Daivari came out wearing fancier new clothing. They’ve tweaked his gimmick a bit as he’s now rich and -- as it was shown during his entrance -- came into the arena today in a fancy new car (maybe a Jaguar? ), and blew off the valet when he motioned for a tip. Ali had the advantage early. He went for a tornado DDT but Daivari countered with a spinebuster. They had a pretty good back and forth match while it lasted. Ali was going for the imploding 450 splash when Drew Gulak came out with a megaphone and a sign saying “No Fly Zone.” This distracted Ali, allowing Daivari to ground him and lay him out with a hammerlock/lariat combo for the win. Dasha Fuentes interviewed Gulak backstage. He said tonight we’ve seen the first steps of a bright future for 205 Live. Ali’s short-sighted high flying brand of competition -- that has no future. He will stop at nothing to create a better 205 Live. I thought this was a solid main event. It probably would have been a better match with a hot crowd, but that can be said for virtually every episode of 205 Live. Aries tweaked his knee when going for a 450 splash, giving Perkins the opportunity to work over that body part. Aries fought back and eventually did land the 450, but Perkins got his foot on the rope. Aries followed with the Last Chancery, but Perkins managed to make it to the ropes and bailed to the outside. Aries went to throw him back in, but TJP cut him off and went for the detonation kick. Aries floated behind him and boxed his ears, then followed with the discus fivearm for the win. Neville’s music hit as he came to the ring, looking for a fight. He tried to take Aries out but Aries countered with the Last Chancery. TJP came in and broke it up, then both of them stomped on the prone Aries. TJP laid him out with the detonation kick and Neville sealed the deal with the Rings of Saturn. TJP dabbed on the downed Aries as he and Neville made their exit, closing the show. Beyond the main event segment, which was pretty good, the rest of the show was subpar. This was a story-heavy episode of 205 Live, which means this episode in particular pretty much exposed that none of the stories are all that great right now. No one really reacted to anything going on, making everything feel flat and poorly executed. People can have all the talent in the world, but when you put them in scenarios that make it 10 times tougher to get over, most of the time even the most talented people can’t keep their head above water. Between the predictable, flat ending of the Dar storyline they’ve been pushing for months, the Kendrick/Tozawa feud that feels like it’s never going to end, and the Gulak/Ali feud that already feels pretty bad, this episode was a perfect representation of that.